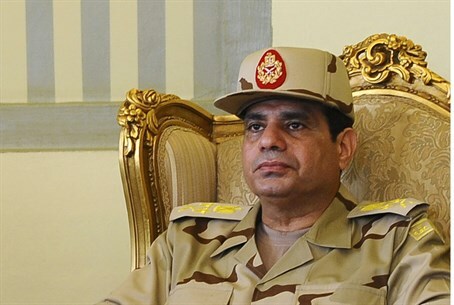 MainAll NewsMiddle EastEgypt's Military Has Cured AIDS? Egypt's Military Has Cured AIDS? Egypt's military has come out with a shocking "medical breakthrough." On Sunday, the army announced its new "Complete Cure Device," which it says can treat cancer and hepatitis C every time, and which doctors call a "scientific scandal." Maj. Gen. Ibrahim Abdel-Atti, head of the Cancer Treatment and Screening center, praised the new device, bragging "I defeated AIDS with the grace of my god at the rate of 100%. And I defeated hepatitis C."
According to Abdel-Atti's research team's claims, the device draws blood, "breaks down" the disease, and returns the now cancer-free blood back to the patient, reports CNN. The "wonder cure" is supposed to be available to the public in June, conveniently after mid-April when army chief Abdel Fattah al-Sisi is expected to run for and easily win the presidential election. Sisi attended the Sunday unveiling of the device, which has been approved by Egypt's Ministry of Health. Despite the army's glowing confidence in its miraculous invention, Essam Heggy, the scientific adviser to Egypt's President, was less than enthusiastic on Tuesday. "I want to be clear and explicit, what has been said and published about the invention of the armed forces hurts the image of scientists and science in Egypt," said Heggy, adding the device was a "scientific scandal" for Egypt. Heggy's criticism was evidently seen by some as an intolerable questioning of the military. Mohammed Abu Hamed, an Egyptian politician and vice chairman of the Free Egyptians Party, called for Heggy to be fired on Wednesday for "his offensive comments to Egypt and the army." However, another Egyptian expert shared Heggy's reservations. Dr. Gamal Shiha called the declaration "not scientifically disciplined. There is nothing published, and there is nothing in medical conferences, and there is no single eminent professor around the project. Nothing scientifically relevant has been said." Egypt has the world's highest rate of hepatitis C, as over 10% of Egyptians are plagued by the disease according to figures from the Centers for Disease Control and Prevention. The spread of sexually transmitted diseases may partially be due to Egypt's abysmal treatment of women. A study last November found Egypt had the worst women's rights in the Arab world; further, a UN report last April found that 99.3% of Egyptian women and girls had been sexually harassed. Gil Ronen contributed to this article.